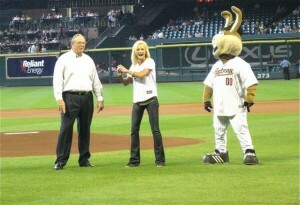 Natalie Niekro threw out the first pitch at the Houston Astros game on September 13, 2009. She will be throwing out the first pitch at three Arizona Fall League games between October 26-31 as part of "Aneurysm Awareness Week" at the Arizona Fall League. Unlike the deceptive and tricky pitch that her father used to record 221 major league victories, Natalie Niekro’s goal for the Joe Niekro Foundation is very straightforward and simple. She is determined to turn the tragedy of his death from a brain aneurysm three years ago into a positive by using his memory and celebrity to increase awareness about and funding for brain aneurysm research. Following on the heals of the foundation’s successful initial fundraiser earlier this year, the Joe Niekro Foundation is continuing its mission of “Knuckling Up for Aneurysm Research” by teaming up with the Arizona Fall League to raise money and increase awareness. The Fall League has designated the week of October 26 as “Aneurysm Awareness Week.” As a result, every strikeout recorded that week by a pitcher from one of the seven teams that Joe Niekro played for during his 22-year career in the majors will result in a donation to the foundation. In addition, Natalie, a marketing executive in Scottsdale, and her husband, Luke Woosley, will match each donation.